Did you know that this picture of drinking chocolate is from an advertisement for Bensdorp's Cocoa, instructing people to enjoy the cocoa, which they called "the food of the Gods." 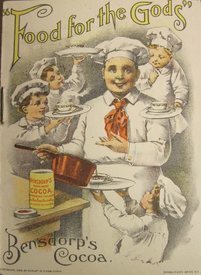 The advertisement, which appeared in 1898, accompanied an announcement that the World's Fair Columbian Exposition in Chicago of that year recognized Bensdorp as its official cocoa sponsor. The fair organizer's ordered thousands of pounds of Bensdorp’s Cocoa to be served to guests.